Tropical geometry is a combinatorial shadow of algebraic geometry, offering new polyhedral tools to compute invariants of algebraic varieties. It is based on tropical algebra, where the sum of two numbers is their minimum and the product is their sum. This turns polynomials into piecewise-linear functions, and their zero sets into polyhedral complexes. These tropical varieties retain a surprising amount of information about their classical counterparts. Tropical geometry is a young subject that has undergone a rapid development since the beginning of the 21st century. While establishing itself as an area in its own right, deep connections have been made to many branches of pure and applied mathematics. 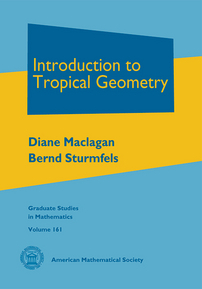 This book offers a self-contained introduction to tropical geometry, suitable as a course text for beginning graduate students. Proofs are provided for the main results, such as the Fundamental Theorem and the Structure Theorem. Numerous examples and explicit computations illustrate the main concepts. Each of the six chapters concludes with problems that will help the readers to practice their tropical skills, and to gain access to the research literature. This wonderful book will appeal to students and researchers of all stripes: it begins at an undergraduate level and ends with deep connections to toric varieties, compactifications, and degenerations. In between, the authors provide the first complete proofs in book form of many fundamental results in the subject. The pages are sprinkled with illuminating examples, applications, and exercises, and the writing is lucid and meticulous throughout. It is that rare kind of book which will be used equally as an introductory text by students and as a reference for experts. Tropical geometry is an exciting new field, which requires tools from various parts of mathematics and has connections with many areas. A short definition is given by Maclagan and Sturmfels: “Tropical geometry is a marriage between algebraic and polyhedral geometry”. This wonderful book is a pleasant and rewarding journey through different landscapes, inviting the readers from a day at a beach to the hills of modern algebraic geometry. The authors present building blocks, examples and exercises as well as recent results in tropical geometry, with ingredients from algebra, combinatorics, symbolic computation, polyhedral geometry and algebraic geometry. The volume will appeal both to beginning graduate students willing to enter the field and to researchers, including experts. Undergraduate and graduate students and research mathematicians interested in algebraic geometry and combinatorics. Who should read the book? Everybody who wants to learn what tropical geometry can be about...The result is a straight path to tropical geometry via combinatorial commutative algebra and polyhedral combinatorics. In this way, the book by Maclagan and Sturmfels will become a standard reference in the field for years to come. This book makes the subject accessible and enjoyable, requiring only a minimal background on algebra. The book develops the theory in a self-contained way, adding plenty of examples to illustrate or highlight some points, with detailed computations and wonderful figures. Each chapter comes with a set of problems to test the potential reader's grasp of the subject. The book, under review, is a beautiful addition to the successful Graduate Studies in Mathematics textbooks of the AMS.